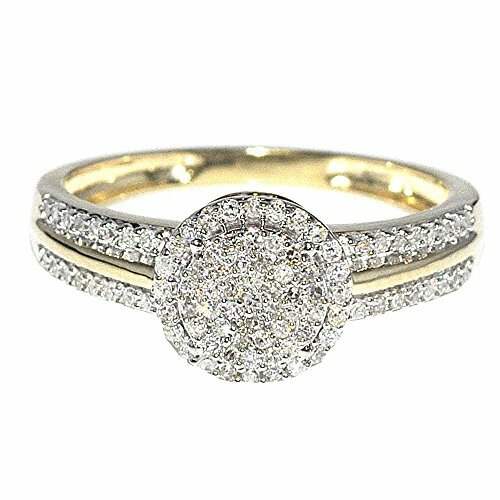 1/4cttw Diamond Engagement Ring Bridal Ring 10K Yellow Gold Halo Style 8mm New(i1-i2 Clarity, I/j Color 0.25cttw) Item Type: wedding-ring-sets Gem Type: white-diamond, Metal type: 10K yellow-gold Fine Jewelry Collection by MidwestJewellery Jewelry Box is included with the purchase, ships within 24 hours wight signature confirmation Images are enlarge to show details, All gem weight and metal weight are approximate values. Our colored diamondsa are irradiated to produce color, gemstones may be heat treated. All our Diamond jewelry comes with 90 days limited warranty, Ring sizing if requested will incurr additional fees and sizing fees are not included in the purchase price. Sizing may take 1-2 additional days.